Distribution: East coast of New South Wales and southern Queensland usually along watercourses and swamps. linariifolia...leaves similar to that of the genus Linaria. Melaleuca linariifolia is usually a hardy tree to about 8 metres in height. It is widely available in general horticulture and is used for both home gardens and in landscaping. A number of shrubby forms are known and some are in general cultivation. These include "Snowstorm", a shrub to 1.5 metres and "Sea Foam" , a larger plant to 2.5 metres. The white flowers occur in prominant, fluffy clusters which cover the plant in late spring and summer to almost exclude the foliage from view. 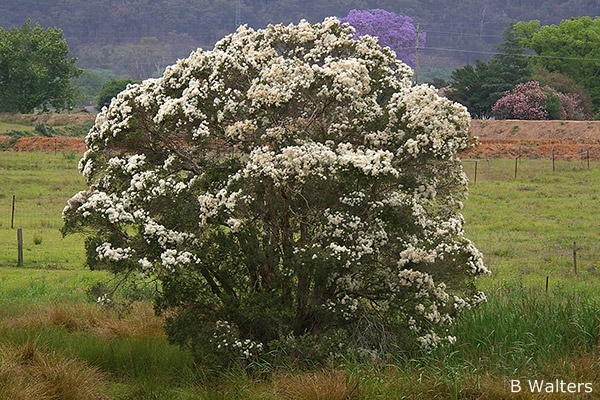 It is this flowering habit that has given rise to one of the plant's common names, "Snow-in-Summer". The leaves are linear in shape and about 25 mm long. M.linariifolia has proven to be adaptable over a wide range of climates and will tolerate less than perfect drainage. In nature it is often found in areas which suffer periodic innundation. It does not thrive or flower well under dry conditions. Flowering is best in a sunny position. Propagation is easy from both seed and cuttings. However, propagation of named cultivars must not be carried out from seed because of seeding variation that occurs.